Artificial lighting, or flash from your camera can make food photos look unnatural and unappealing. Set your ‘stage’ next to a window, where natural light can illuminate the food and highlight the vibrant colors without distorting them. Staging your food photo is important. Placing the food to highlight dimensions can make your photo more dynamic and interesting to the eye. Try grabbing a fork full of the dish and lifting it over the plate. Not only will this create depth but it will also give the viewer the perspective of a diner. Using unexpected angles is a good way to make your food photos more interesting, which can lead the viewer to spend more time looking at the picture. 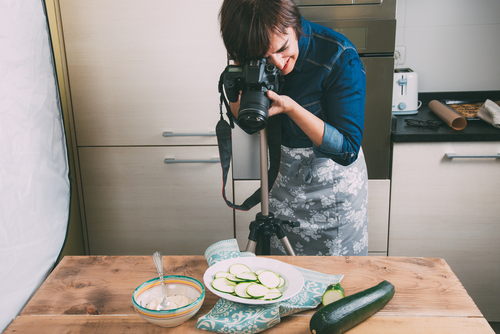 Taking food photos from straight above the dish is currently a popular angle amongst food photographers. Using a white dish, especially when using brightly colored ingredients, will make the food pop against the neutral colored plate. This will ensure that the focus in on the food and potential customers are not distracted by the flatware. Once you have the perfect food photos you have to share them with potential customers. Be sure to add your photos to your website and all social media. Facebook and Instagram are both great social media platforms to use to share any visuals. Learn how SinglePlatform can put your photos in front of new customers who are looking for restaurants like yours.